Why are stripes appealing? Stripes on the loom look good. I don’t usually wind warps in advance. 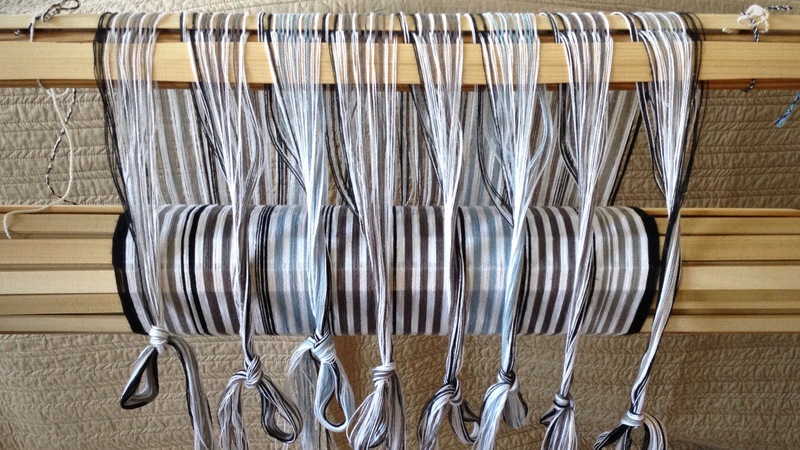 I like to wind a warp and put it directly on the loom. But, recently, when I wasn’t able to weave, I was able wind warps. Now, one of those warps is beamed, and soon I’ll be weaving some striped plattväv towels. This draft is from one of my favorite Swedish weaving books, Kalasfina Vävar, by Ann-Kristin Hallgren. I changed the colors and modified the stripes, while attempting to keep the attractive appeal of the original stripe design. We will see the full effect when weaving begins. The warp is the first part of the picture. The weft always brings a transformation. 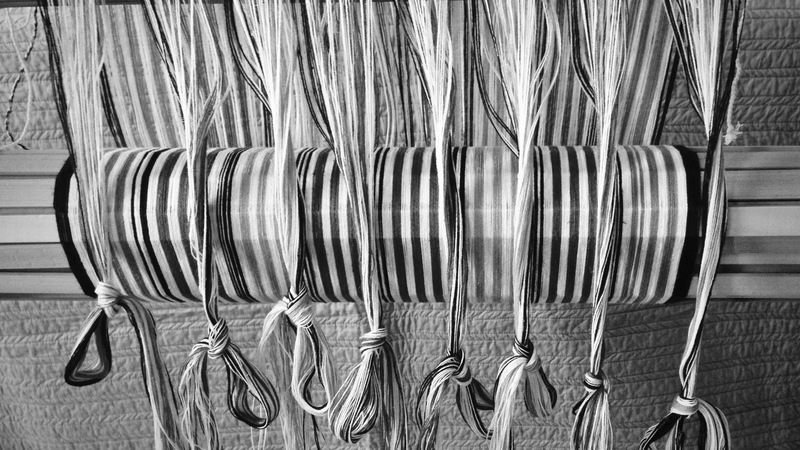 The golden bleached linen, in this case, won’t change the warp, but it will create a fresh palette. Making a black and white photo is a good way to see the color values. Faith and truth are partners. Truth becomes clear through faith. Warp and weft. Truth and faith. A fabric of convictions is woven to hand to the next generation. The good news of Jesus Christ is a message of faith and truth. The truth doesn’t change; but it comes alive when woven with faith. May your convictions be securely woven. D’Anne, I’ve been looking forward to this one. It’s going to be fun! Please tell us more about the plattväv towels have never heard the term. Hi, Maggie, Plattväv (flat weave) is plain weave with weft pattern floats, similar to dice weave or monksbelt. This one has all the white threads on shafts 1 & 2, and all the colored threads on shafts 3 & 4. There are three treadles. Besides the two plain weave treadles, a third treadle is used for the weft pattern floats. It is going to be interesting to play with! Oh I adore this warp! Really looking forward to seeing you weave the pattern. Martha, I’ve been wanting to do this one for a long time. It’s exciting to get it on the loom!